Uganda is Africa condesed with the best of everything the continent has to offer it’s the home of the longest river Nile river in the world, the tallest mountain range in Africa , the glacier capped Rwenzoris,Lake Victoria the largest fresh water in Africa, highest concentration of the primates in the world including more than half of the remaining mountain gorillas roams it’s forests, the birds in the western, eastern northern,free flowing waters, dense vegetations with huge tropical forested trees forested trees. After an early breakfast, set out for Murchison Falls national park via Masindi town arrive at the park. It is named because of the spectacular Murchison Falls, where the world’s longest river detonates fervently through a tapered crevice in the Rift Valley escarpment to thrust into a foaming pool 43m below. Along the way , you will visit the Zziwa rhino sanctuary. This sanctuary was set up to reintroduce rhinoceros to Uganda which had become extinct in 1982. This 70 square kilometer sanctuary in an immaculate bush country is currently home to the only wild rhinos in Uganda. The long term goal is to build a sustainable rhino population and move rhinos back to their original habitat in Uganda’s protected areas. Wildlife populations have largely recovered from the poaching of the 1980s; in the lush borassus grassland to the north of the Nile, elephant, buffalo, giraffe and a variety of antelope are regularly encountered on game drives, while lion are seen with increasing incidence. Visit the top of the falls. You will have an opportunity to see the Nile’s beauty perfected as you watch the Nile water fall into a 45 meter plunge, forming a rainbow. And then later your will retire for dinner and over night at. Early in the morning, you will take a cup of coffee and then go for a game drive where you will encounter Giraffes, Lions, Elephants, baboons, and a number of different antelopes. Return to the lodge for mid morning breakfast and then later in the after noon, In the after lunch go for a launch cruise on the Victoria Nile upstream to the base of the Murchison falls. Budget – Chimps nest Moderate – Primates Lodge Kanyankyu Cottages / Rwenzori View Guest House Up Market – Ndali Lodge Day 4 Chimpanzee tracking and transfer to Queen Elizabeth Np. Early morning breakfast and then trek the Kibale Forest to search for Man’s closet cousins the Chimpanzees. (persons must be of a minimum age of 15 years). Game drive and launch cruise. At the Buhoma Headquaters of the Uganda Wildlife Authority a ranger guide will brief you about Gorilla trekking protocol. You should carry a packed lunch and water for this activity. The time taken to track gorillas is erratic for it can take 2- 10 hours. This is the one of the unique tour activities that Uganda has. And onencounter of these gorillas, one may be forced to say; it is a worthwhile!!!! Dinner and overnight at the camp. After breakfast depart for kisoro, stopping at the Kanaba gap to view the Virunga volcanoes and terraced hills, visit Lake Mutanda and take a wake at its shores. 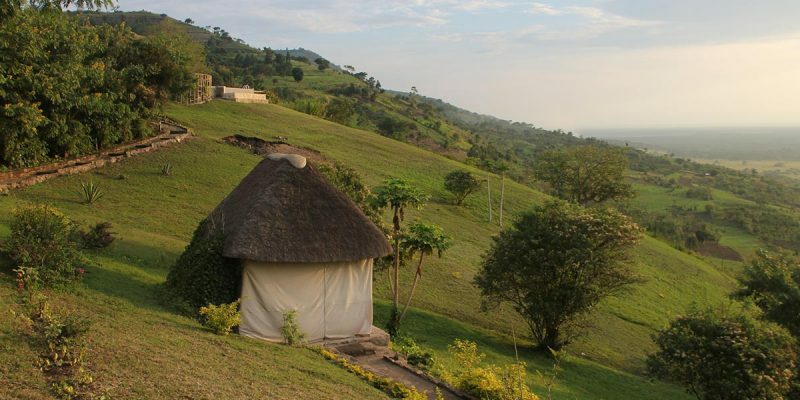 Stay in Kisoro for a night and relax your tiered legs. Day 11: To Ssese Island. Day 12: At Ssese Island.